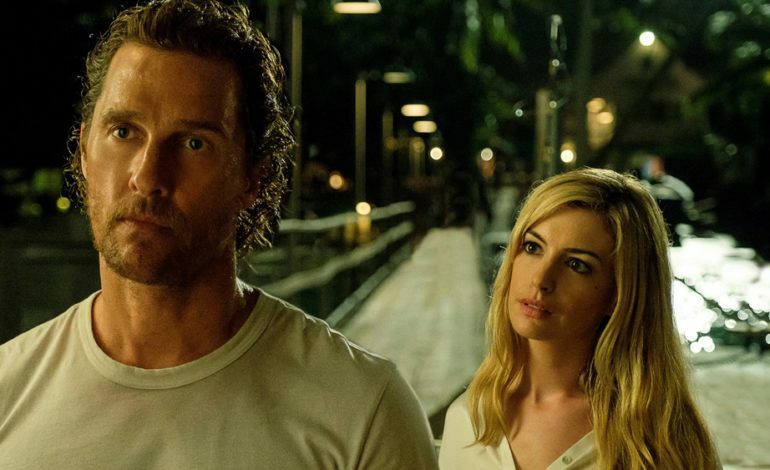 Steven Knight‘s upcoming film Serenity, starring Anne Hathaway and Matthew McConaughey, has just dropped its first trailer, and it’s plain to see that the film will be far from serene. The trailer opens with a disconcerting silence that seems to surround every part of the screen. The only thing to pull us from the quiet is the voice of McConaughey’s character, seemingly distraught, talking about how much every person in his small coastal town seems to know everything, and nothing, all at once. Through the beautifully shot scenes of the ocean, and the stark, lovely shots of the actors, we feel tensions rise like the tide. When we meet Hathaway’s character, we learn that she has reunited with McConaughey to convince him to murder her abusive husband. “I want you to take him out on your boat, and drop him in the ocean for the sharks,” she says in an intense and emotionally distant voice. Continuing on, tensions rise and rise, until they’re met at a crescendo that uses the escalating sound of a fishing reel to brilliant effect. Hathaway and McConaughey aren’t the only powerhouse actors in the film. In fact, the majority of the cast have award nominations under their belts. These names include Diane Lane, Djimon Hounsou, and Jason Clark. Are you ready for the bloody, thrilling ride this oceanic drama is bound to take you on? We know we are. The film is set to release in theaters on October 19, 2018. Check out the trailer below.